Greywater is wastewater generated from domestic processes such as dish washing, laundry and bathing. It gets its name from its cloudy appearance and from its status as being neither fresh (white water from groundwater or potable water), nor heavily polluted (blackwater, which contains feces or toxic chemicals). Greywater makes up 50-80% of residential wastewater, and can be easily recycled for domestic and irrigation use. This kind of water recycling saves money and also helps to limit water wastage and over-use in South Africa. 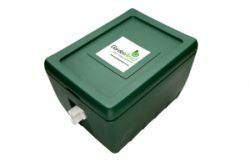 Check out the various products that can assist you in recycling greywater in your home and garden.